Fan Bing Bing (范冰冰) attended the L'Oreal And Cannes Film Festival 15th Anniversary Dinner held during the 65th Annual Cannes Film Festival held at Plage Orange in Cannes, France on May 17, 2012. 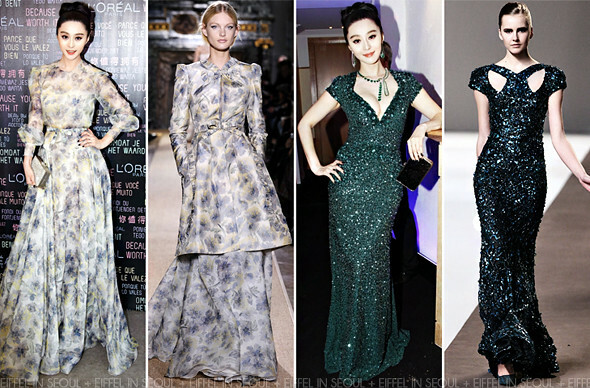 The gorgeous Chinese star opted for a floral Couture gown from Valentino Spring 2012 Haute Couture collection. Accessorizing her look with an up-do and silver clutch. Incredibly flawless outfit which I absolutely adore, check out this beautiful smile of hers. The busy actress had a full-day schedule, she was later seen at the 2012 Trophée Chopard Party held at the terraces of Hotel Martinez. She complemented her embellished Elie Saab Fall/Winter 2010 dress with emerald jewels from Chopard and a black clutch.